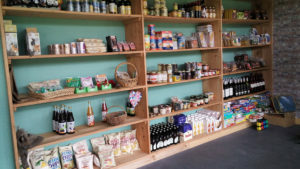 In our front desk building you will find an organic shop with a small, yet extraordinary stock. Here we sell delicious soup, coffee, rice, beer from the ’t IJ brewery among others, pasta and cleaning products. We also have organic ice cream and beef from our own Jersey bulls. Our chicken lay eggs, unfortunately, however, not throughout the year. If there are eggs available they can be purchased in the shop. 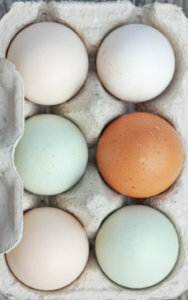 The various colors of eggs are proof of the variety of chicken. For the hearth we have oak and fireplace logs for sale, as well as beautiful felt products. In our shop you could also borrow books and comics, films and games for a pleasant evening or afternoon in your cottage. The Otterlo village has a Spar supermarket, offering an organic stock and a delivery service for our holiday resort all through the week. You could inform about it with the Spar staff.